A little contrast stitching is the only embellishment needed for the spicy red leather exterior. 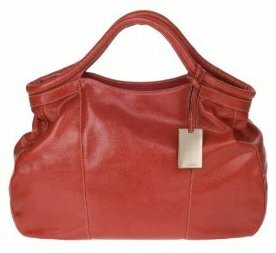 The calfskin is glazed, toning it down and making it more accessible than a vibrant scarlet or crimson. Some might accuse it of playing safe, but I see this shade being much easier to pair with the average wardrobe. The silver Furla nameplate might please label lovers, but personally I think it looks a little distracting. Thankfully it's easy enough to remove. The shopper's interior is a generous space with plenty of room for your daily essentials and any impulse buys. I'd probably have appreciated a few more organizational features, but the large zip pocket and cell phone slip do their best to keep the clutter at bay. The rolled leather handles combine practicality and style. They integrate seamlessly with the rest of the purse, unlike so many straps that appear tacked on. But it's their comfort that will really impress after a long day at the mall!